Birth, death, and marriage records for Charlevoix County are available from the years 1868 to the present. Researchers can use the County Clerk genealogy research area, which is open during normal business hours and is located on 203 Antrim Street in Charlevoix, MI. Copies are $5, and $2 for additional ones. Due to Charlevoix County's location on the cost of Lake Michigan, along with including several islands and Lake Charlevoix within its borders, over 70% of the county area is water. Ferries serve to transport individuals from the mainland to the islands off the coast. The islands, which are part of the Michigan Islands National Wildlife Refuge, are part of the Beaver Island Archipelago, a popular vacation destination for tourists and residents of the area alike. 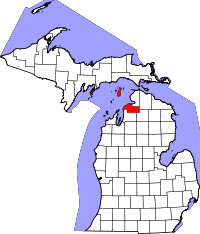 In addition, two of the islands are part of the three island Michigan Islands Wilderness Area, a nationally protected refuge.